Buffalo Cochlear Implant Group is a member-run 501(c)3 nonprofit organization providing support and education to cochlear implant users, the deaf, hard of hearing, and their families. We produce a newsletter quarterly, with help and assistance via personal experience stories, from the many people out there who have benefited from Cochlear Implant Programs. We hold four socials/informative workshops each year. The group members consist of cochlear implant patients, parents of cochlear implant patients and their support personnel who are committed to research and development of therapy to help with both speech and sound in this exciting field. Our hope is that the implant users, their support people, and the professionals involved in the communicative disorders fields will greatly benefit from the sharing of experiences and ideas. Come join us and share your experiences with The Buffalo Implant Group. This year on January 15, 2015, marked 30 years of the Buffalo Implant Group existence. We will be celebrating for being a wonderful source of counseling, support, communicating and sharing stories of those past, present and future. The stories are of those who have taken the journey of persuading, receiving and experiencing a newfound hearing with Cochlear Implant(s), BAHA, or ABI (Auditory Brainstem Implant). Over the years, BIG has grown in numbers and we will continue to grow as more people are becoming aware that they or a family member or a friend are either candidates for a Cochlear Implant(s), BAHA or ABI. This group would have not been possible if it wasn’t for our Founders. When the group was founded on January 15, 1985, our founders had no knowledge of any other implant group. They also did not have any knowledge of the personal stories that accompany such undertaking. In February of 1986, Craig Carpenter discovered a newly formed Cochlear Implant Club International (CICI) operating out of Nashville, Tennessee. B.I.G became the first affiliated Chapter of CICI, which later went on to become known as the Cochlear Implant Association, Inc. Unfortunately, Cochlear Implant Association Inc. is no longer active and was absorbed by HLAA during the summer of 2003. The journey of B.I.G begins with Craig Carpenter and Howard Tagg in 1984. They were the first two individuals to be selected for implantation by Dr. Irwin Ginsberg of the Buffalo Otological Group (B.O.G) in the Northeast region with experimental devices. Given the unknowns, they thought it would be a good idea to stick together, share their ideas, fears, and hopes as they went through the pre-op testing and evaluations; the surgery itself to the healing and finally activation to give a full feedback on their individual experiences. Since this was a relatively new procedure at that time, they had no one to contact or to reach out to, to get information on the implant. The choice of what type of implant to use was left to the doctors. Only one was approved by the FDA at that time, the House Ear Institute device manufactured by 3M. The group’s first meeting was held at the home of Craig Carpenter with seven people in attendance including three candidates, their support team and the audiologist from the ENT center. At that time the group would hold monthly meetings in which they would discuss over their new hearing and the effects that it had on their lives and those around them. Since this was a new type of sound that was hard to describe, they tried ways to better understand what they were hearing while giving some insight to problems to help those in the group along with the CI team understand how to improve upon what they have gained. As time went on the Buffalo Otological Group ceased doing implants in 1992. B.I.G began meeting quarterly and then annually for the summer picnic. In 1998 when Dr. Andrew Marlowe came on the scene doing implants at Buffalo General, B.I.G tried to begin meeting again. The older members couldn’t make the meetings as the idea of traveling was too much for them. So B.I.G decided to focus on the new recipients and being available for one-on-one chats for prospective recipients. At that time Gail Cronin, our current newsletter editor today, was putting together a CI rehab program along with Joann Hammer, Au. D at Buffalo Hearing and Speech Center. Not too long after, Dr. Marlowe left us soon after he had a taste of Buffalo’s harsh winters and he relocated to Sarasota, Florida. Dr. Marlowe is no longer associated with CIs. Hence, we were blessed with the presence of Dr. Ernesto Diaz-Ordaz soon afterward and he has since performed CI surgeries with regularity in the Buffalo area. Dr. Ernesto Diaz-Ordaz is still in practice today! When B.I.G first began Craig Carpenter was the first and only president of the group except for the two years the now late Ed Bastian was president. 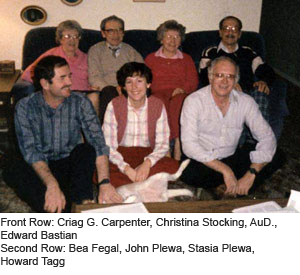 In 1998, Gail Cronin and Craig Carpenter shared the duties of keeping the group going and doing the newsletters. In 2003, we elected Peter O’Hara, who served us well. In the Spring of 2006, we elected Winnie Morrison. In the Winter of 2007, we elected Joe Kolis who was the only president who did not have a cochlear implant but he served us well and was a tireless worker and donor to B.I.G. In the spring of 2011, we elected our current president Sue Wantuck, who we admire for her organizational skills and tireless efforts to help grow and expand the group in the Buffalo communities. Mr. Thomas White, past coordinator of the Cochlear Implant Programs at the Buffalo Otological Group. Ms. Christina Stocking, a past Audiologist also with B.O.G who was most directly associated with the implant and the post-op therapy. The Buffalo Club of the Deaf, had also shown their support for our group by allowing us at the time to use their building for our own needs.